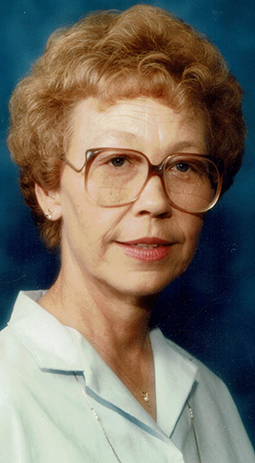 Graveside services are scheduled for 10 a.m. Saturday, May 19, at Woodbine Cemetery for Frances Louise Giles of Clovis. Giles, 81, passed away Tuesday, May 15, 2018, at Wheatfields Senior Living Community in Clovis. Visitation will be held until 5 p.m. today and from 8 a.m. – 6 p.m. Friday at Muffley Funeral Home, 1430 Thornton, Clovis. Frances was born Feb. 28, 1937, in Artesia to Loy and Nannie (Harrison) Crouch. On Aug. 21, 1953, she married Buddy Gene Giles in Artesia, and the couple moved to Clovis in 1977. Frances worked for Kmart food service and enjoyed painting, ceramics and needlepoint. Survivors include sons Jerry Giles of Clovis and Larry Giles of Albuquerque; daughter Betty Hobbs and husband Vince of Cache, Okla.; sisters Altha Crouch of Clovis and Peggy Rounds of Soldnata, Alaska; grandchildren Brandi Hobbs, Brianna Giles and Nathan Giles; and great-grandchildren Serena Giles, Sergio Giles, Sammy Giles and Sean Giles. She was preceded in death by her parents, Loy and Nannie Crouch; husband Buddy Giles; brothers TJ Crouch and Jake Crouch; and sisters Betty Crouch, Ruby Crouch, Ima Jean Stoup, Lois Stitch, Leola Downing and Lorene Harper. Arrangements are under the direction of Muffley Funeral Home. Condolences may be expressed online at www.muffleyfuneralhome.com.